When I posted on the North 12th Street Complete Street Project, I expressed concern about how the cycle track to the north would transition to the bike lane to the south, and how bicyclists northbound would access the cycle track. On Wednesday I attended the project open house at City Hall. Preliminary designs presented by the contractor Echelon Transportation Group indicate one possible design for the intersection of 12th Street and C Street, a protected intersection. These conceptual design drawings are not yet available on the North 12th website, so I don’t have a drawing to share here. Comments from the open house and online will be used to revise the concepts, and they should then be available on the website for further review and comment. The protected intersection is a design new to the United States, and so far not built anywhere in its entirety. The design is fairly common in bicycling friendly countries in Europe. 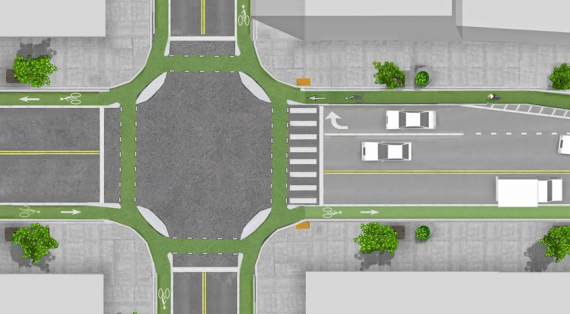 The Protected Intersections for Bicyclists website provides a great video showing how the design works by providing a higher level of safety for bicyclists and pedestrians without much impact on motor vehicles. The design has not yet been included in the NACTO Urban Bikeway Design Guide, but I would guess it soon will be. The diagram at right shows the general outline of a protected intersection. The intersection at 12th and C would look like the right half of the diagram on the west side, with the almond shaped corner medians, but would not look like the left half on the east side. Bicyclists heading south out of the cycle track would either continue south in the bike lane or use the protected intersection to turn east and then continue south on lower traffic streets. Bicyclists coming from the east would use the protected intersection to get to the west side and the cycle track.